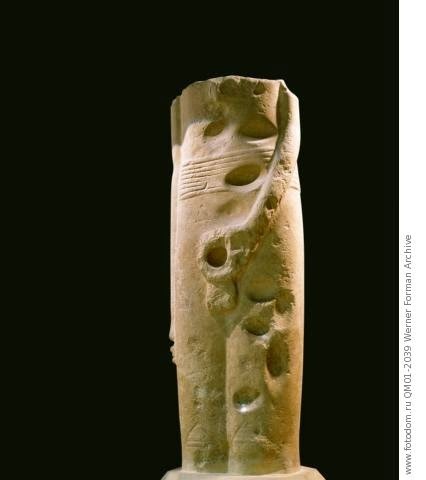 One of the three colossi of the ithyphallic god Min which were found at Gebtiu (Koptos, modern Qift). These statues, now badly battered, are the only known examples of monumental temple sculpture of the late Predynastic Period. This way of portraying the god Min was to last for the rest of Egyptian history. Country of Origin: Egypt. Culture: Ancient Egyptian. Date/Period: Late Predynastic. Material Size: originally 4 metres tall. Credit Line: Werner Forman Archive/ Ashmolean Museum, Oxford . Location: 35.